You’ve taken the decision to become an entrepreneur. Congratulations! But did anyone tell you about the emotional rollercoaster you’ve just boarded? This rollercoaster can occur over the course of the month, week, day or even the hour. Some people are sure they are made to be entrepreneur, others are not quite so sure! One moment you’re on top of the world and you feel like nothing can beat you. The other moment you just wanna cry, hide yourself and quit it all. Despite this, I more and more recognize the moments in my life as entrepreneur that make me feel like I’ve made the right choice. Here my top 5. That feeling in your body when you’ve got an idea. It’s a mix between adrenaline, being nervous, being excited, being scared and being happy.. and probably a whole lot of other emotions in between. You keep moving around and staring at the ceiling, and basically you just want to get out of bed and write all that stuff down. When I was looking for a co-founder this was actually one of my requirements. Both of the guys that joined me at accessART actually came to me at some point telling me they had so much inspiration and were so excited about the concept that it kept them awake at night. Recipe for success!! Travelling is what I do. As much and as long as possible. Until I started my company. The travelling and holidays were fine when I was still a solo founder. But, while I started to collect a team around me, I was getting ready for a 2-month trip to the Philippines and Australia. When the day came that my trip started.. I was not that excited anymore! I mean, I still was excited to go and enjoy the sun, warmth and parties.. but I kind of wanted to keep working and grow my company. The result was quite a good mix – I worked 4-5 hours day and enjoyed the sun and beaches in the meantime. Good combination 🙂 , but I couldn’t wait to get back to my time and start making real progress! 3. Become an entrepreneur – When I’m happy it’s Monday! To be honest, as soon as you start your own company, there is no such thing as weekends. Yet, most of the world stands still on Saturday and Sunday 🙂 For me these are typical days to fix the administration, write a blog ( 🙂 ) or read some things I have been wanting to read. But, most of the time I’m looking forward to Monday. Get back to the office, get the team together and discuss the goals for next week. Most Mondays I get out of bed with lots of energy – it’s just the Dutch weather that ruins my mood occasionally 🙂 . Monday has become a day of fresh starts, new inspiration and a new week to reach targets! I recently had the pleasure of overhearing a friend talking about my company to someone I didn’t know. They explained the concept and even tried to convince that person that it was such a cool concept and they should definitely check it out. This was such a great feeling 🙂 . 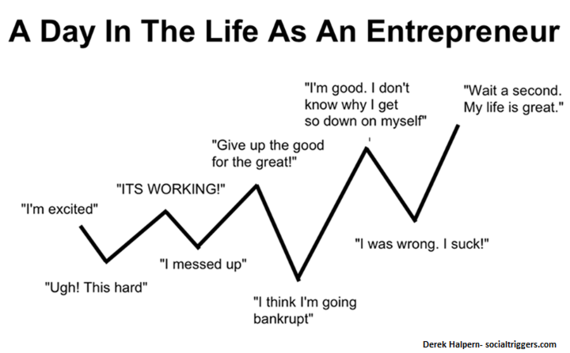 This really made me realize that the decision to become an entrepreneur was one of the best I could have taken! It’s so rewarding when you can make other people enthusiastic for a concept! This point does not need much explanation. When you decide to become an entrepreneur you will have people who are happy for you, who support you, but there are also people that will be jealous or simply don’t care. So cherish the people who are proud of you – and mostly the ones who actually tell you they are! Can you find the word proud (trots in Dutch) on the “guest painting” (our version of the guestbook) from our Office Warming party? These are my 5 moments so far that made me happy I took the jump into entrepreneurship 🙂 When do you know it was the right decision?